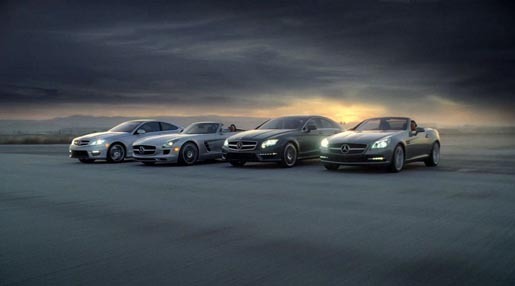 Mercedes ran “Welcome”, a Super Bowl television commercial, this week, launching the SLS AMG (Gullwing) Roadster, C-Class Coupe, CLS 63 AMG and SLK i. The TV ad shows 50 driverless cars from the past leaving their homes to greet the five new cars. Included in the spot are the Mercedes ‎540K Special Roadster, Mercedes Hawk SL, 1934 Mercedes 150 Sports Roadster, Mercedes 123 series, 300 Diesel, Mercedes W100, Mercedes 300 SL Gullwing, Mercedes 280SE cabriolet, Mercedes 180D, Mercedes 300 Adenauer. The ad is set to music from Janis Joplin’s 1970 track, “Mercedes Benz”. P Diddy makes a cameo appearance to ask if anyone’s seen his silver Mercedes Benz. The Welcome commercial was developed at Merkley and Partners by executive creative director Andy Hirsch, creative director Chris Landi, agency producer Chris Ott. Editing was done at Rock Paper Scissors. Post production was done at The Mill, London. Sound was mixed at Sound Lounge by Philip Loeb with assistant mixer Evan Mangiamele and executive producer Gloria Pitagorsky.